It is a well-known fact that NVIDIA AGX Xavier is much more efficient than its predecessor NVIDIA Jetson TX2. NVIDIA AGX Xavier provides 20X performance and 10X energy efficiencies compared to NVIDIA TX2. That is sweet. But how is e-con Systems’ camera e-CAM130_CUXVR going to help with it? Let’s find out. There are very few 4K cameras available for Jetson AGX Xavier. e-CAM130_CUXVR is superior in the list. Because e-CAM130_CUXVR is not only support 4K @ 30 frames per second. But also support the maximum resolution of 13 Mega Pixel. There is no other MIPI CSI-2 Camera in the world that can support 13 Mega pixels at the frame rate of close to 20. Does your application demand very high resolution? Here is the camera for you e-CAM130_CUXVR. Being a camera partner to the Jetson platforms, we always strive best out of these NVIDIA Jetson platforms. We have released six synchronized Full HD cameras and three synchronized 4K cameras for NVIDIA Jetson TX1 and TX2. The Successor to NVIDIA TX1/TX2, NVIDIA Jetson AGX Xavier supports up to four 4-lane cameras. Three 4K @ 30 fps is possible with TX1/TX2. Jetson AGX Xavier can do more. So, do we. e-CAM130_CUXVR can support upto four Synchronized 4K cameras at 30 frames per second. If you ask me what makes e-CAM130_CUXVR unique, I would say Synchronization. No other vendors are supporting the synchronization feature for NVIDIA Jetson cameras. When the application demands multiple cameras, it is going to be challenging if those cameras aren’t synchronized. Being it for stereoscopic images or panoramic imaging, it is going to be impossible to use those cameras if they not synchronized. When the object moves one camera to another camera, images should be synchronized in micro seconds. So e-con Systems has implemented this in hardware. Because software synchronizations are not reliable and also delay might be too much for certain application. 444 – 4 Synchronized 4K MIPI CSI-2 4 Lane cameras for Jetson AGX Xavier. AR1335 is a highly rated Image sensor. e-con Systems is providing this camera in all possible ways you can use it. The AR1335 is a 1/3.2-inch CMOS active-pixel digital image sensor with a pixel array of 4208H x 3120V. The AR1335 digital image sensor, features breakthrough 1.1µm pixel technology that delivers superior low-light image quality through leading sensitivity, quantum efficiency and linear full well. This will produce amazing quality images. It can generate full resolution (13 Mega Pixel) image at up to 20 frames per second (fps) and supports advanced video modes including 4K 30fps, 1080P 60fps and 720P 120fps. Along with the sensor, each camera module comes with the Image signal Processor. This is to ensure to get the best possible quality images and also for the Auto exposure and Auto white balance. It is a key factor. Unlike the USB cameras, MIPI CSI-2 cameras are not plug and play with standard drivers. It requires V4L2 driver. 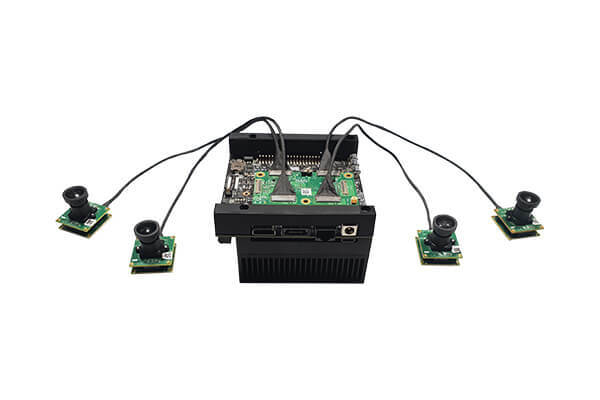 Though e-con Systems provides all the documentations for integrating these cameras to the Jetson AGX Xavier, you might require some support from the experts. It would be easier if you get a chance to interact with our expert. Every camera you purchase from us comes with a two weeks free support. We are happy to help you in your integration. e-CAM130_CUXVR comes with four variants. Quad, Tri, Dual and solo. Customers can opt to purchase anything between single camera to four cameras as according to their requirement. NVIDIA AGX Jetson Xavier with the support of NVIDIA CUDA, OpenCV, VisionWorks, cuDNN & TensorRT provides a large open field to utilize “e-CAM130_CUXVR” ranging from Robotics, Smart Cities, Industrial automation, Surveillance, Healthcare, Retail, Construction, Artificial Intelligence (AI) applications and so on. Hi, we’re looking for a 6 camera solution for the Jetson TX2. The camera cables will need to be several feet long and hence will require Seq-DeSeq capabilities. Could you please suggest which product(s) from e-con systems will be a good fit for this requirement? We do have a camera for your requirement. Have a look at our NileCAM30_TX2 – 3.4MP GMSL camera supporting upto 15mtrs. You can directly purchase it from our webstore and evaluate it.